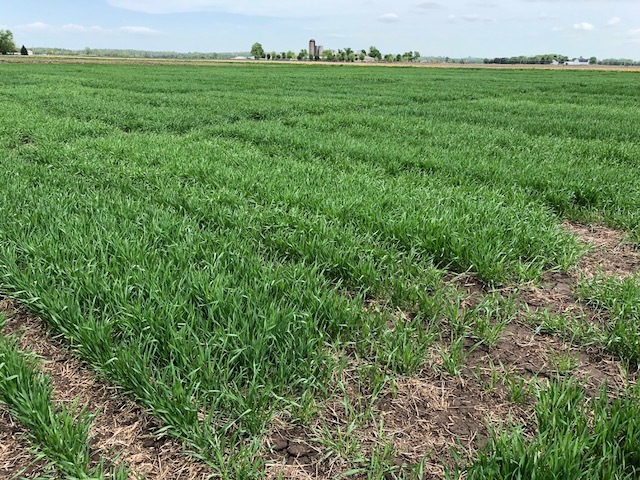 The Wisconsin Field Crops Pathology lab scouted winter wheat in the uniform variety trials located in Sharon and Arlington, Wisconsin late last week. The crop was jointing at both locations. The crop looks very good. We found no disease at either location. At this time last year we already had a significant epidemic of rust started across southern Wisconsin. Thus, the winter wheat crop is looking much better than this time last year, when it comes to the disease situation. We also took a quick look at a couple of production fields in the area and those also appear to be clean. We have also received some reports of wheat conditions around the Fond du Lac area. Wheat is reported to look very good there as well with no disease. We will try to also scout uniform variety trials in those locations in the next few days. Despite good news, weather has been conducive for the development of foliar disease the last few days. I would encourage folks to be diligent in scouting. I would expect flag leaf emergence in the next 1-2 weeks across the winter wheat growing region of the state. We will be entering a very important time to make a decision about your first fungicide application. Considering the current agricultural economy, the decision to spray fungicide is going to be critical to try to break even this year. I would hold off as close to the anthesis growth stage to “pull the trigger” as you can wait. This will help maximize fungicide use to control both of the major diseases of wheat that we see in Wisconsin, stripe rust and Fusarium head blight (FHB; scab). However, if stripe rust shows up after flag leaf emergence, it might be necessary to apply a fungicide before anthesis to control a rust epidemic, especially on susceptible varieties. Based on previous research conducted by our laboratory in Wisconsin, we know that an application of fungicide that closely coincides with the start of the rust epidemic can be very effective in preserving yield on susceptible and moderate susceptible varieties. Many fungicides are effective in controlling stripe rust, including the industry leaders used for FHB control, Prosaro and Caramba. Therefore, if rust doesn’t show up in your field before anthesis occurs, you can effectively use Prosaro and Caramba to control both FHB and a late stripe rust epidemic. The best case scenario would be to only have to spray fungicide once this season. However, there is still much time left, so diligent scouting is critical to make the best decision. Get out there and SCOUT, SCOUT, SCOUT!